Placing a flat-screen television in your bedroom can provide a comfortable and entertaining escape from reality — as soon as you figure out where to put it. If you worry you may not have the necessary furniture or wall space for a flat-screen television, think again. 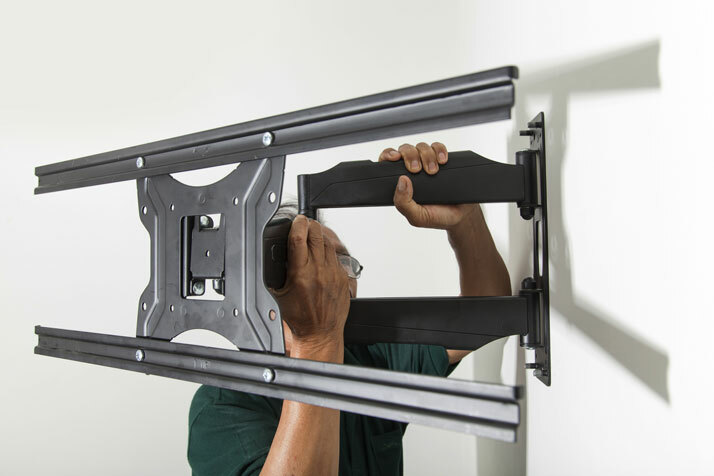 All you really need to do is find a flat-screen mounting solution that meets your needs. Here are a few flat-screen mounting ideas to ensure that your television can be easily seen, complements your decor and is protected from accidents. You will not need to purchase any new furniture with standard wall mounts currently on the market, since they are designed to single-handedly hold flat-screen televisions up against the wall. Plus, since most wall mounts elevate televisions above bedroom furniture, they are kept out of harm's way and viewers can more easily see the screen. Although wall mount types can vary, your choices largely depend on a television's weight and dimensions. You can also find wall mounts equipped with extra features, such as hardware for extension, panning, swiveling, turning and tilting. If you are short on flat wall space, you may want to consider a corner mount, since the space they use is typically empty. Corner mount equipment is made to fit your flat-screen television snugly into angles, with televisions secured near the corners using standard wall mount extensions. If every inch of your wall space is taken, another alternative is to mount the television flat against your bedroom ceiling and equip it with hardware that allows it to lift, lower and turn as needed. Ceiling or arm extension mounts allow you to view your television as you stretch out on your bed. If you want to make your flat-screen television become part of your bedroom's decor, you can also find ways to blend it into your design theme. For example, you can use wall mounts or hinge mounts to place flat-screen televisions behind stylish frames or inside unoccupied fireplaces or wall recesses. There are usually several possible options for attractively mounting or hiding a flat-screen television in a bedroom. However, before you take the plunge and screw hardware into your walls, try experimenting to find the best position. And, if you need even more flat screen mounting ideas for your bedroom, search the internet for other examples or find flat-screen experts and ask for advice.